The Fargo-Moorhead RedHawks have filled the 2013 season with a fun-packed Promotions Schedule. To see the entire 2013 Fargo-Moorhead RedHawks Promotions Schedule, please visit the RedHawks website: http://www.fmredhawks.com/schedule/promo/. The RedHawks Home Opener will be Friday May 24th vs. the Laredo Lemurs at 7:02 p.m. to kick off a three-game series. Opening Night will also be the first Fireworks Night of the season thanks to Sanford Health. The opening series against the Lemurs will have the traditional Magnetic Schedule giveaway from BANK of the WEST on Saturday with a 6:00 start time, and finish up Sunday afternoon. Starting with the Home Opener, the RedHawks will host seven of the popular Post-Game Fireworks Shows in 2013. Fireworks are scheduled for the nights of: May 24, June 14, June 28, July6, July 27, August 2, and August 30 (Fan Appreciation Night). These fireworks shows have become “can’t-miss” events in Fargo-Moorhead area during the summer. There will be three Thursday afternoon Business Day Games in 2013, each with 12:30 p.m. starts. Fargo-Moorhead will host the Lincoln Saltdogs on Thursday, June 6 (sponsored by Arbuckle Lodge), the St. Paul Saints on Thursday, July 25 (sponsored by Ulteig) and the Rockland Boulders on Thursday, August 15 (sponsored by Budweiser). Following each Business Day Game, there will be a free concert in the Budweiser Beer Garden courtesy of Network Center, Inc. The RedHawks will welcome three national touring acts to Newman Outdoor Field in 2013. · Kids Run The Bases: All kids 12 and under welcome to run the bases after the game presented by Erbert & Gerbert’s. · College Night: Show your valid College ID for a $3 General Admission ticket sponsored by the North Dakota Air National Guard. · Post-Game Autograph Party: All RedHawks players will sign autographs down the 3rd base line after the game sponsored by Texas Roadhouse. · Post-Game Concerts: Stay after the game on Thursday Day Games and enjoy a live band thanks to Network Center, Inc.
· Red Solo Cup Night: Every Saturday there will be special Red Solo Cup beer specials. · Tutti Frutti Post-Game Launch-A-Ball: Purchase balls during the game and throw them on the field after for a chance to win prizes. 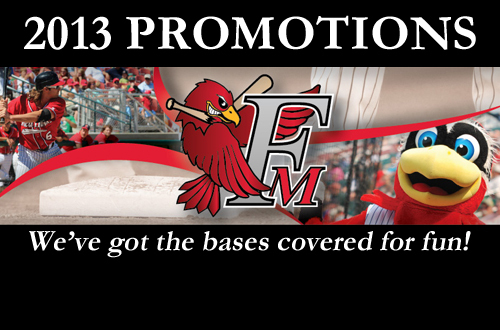 For more information on the 2013 season, call the RedHawks office at 701-235-6161 or email the team at redhawks@fmredhawks.com.